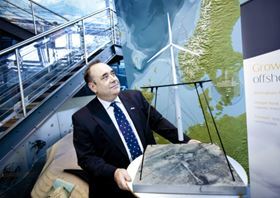 First Minister Alex Salmond views model of Statoil's Hywind turbine in Stavanger in Norway. 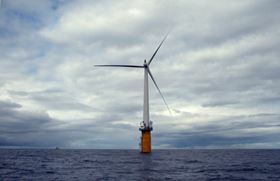 Two potential sites have already been identified – one off the coast of Lewis and one off Aberdeenshire – that could be used for further testing for the Hywind floating offshore wind turbine concept. One Hywind is already in operation 10 km offshore at Karmøy off the west coast of Norway. The offshore wind turbine has been feeding into the grid since September 2009. Scottish Development International and Marine Scotland have both cooperated with Statoil on current feasibility studies for a Scottish project. First Minister Salmond says: “We are working to maximise the huge benefits that offshore wind can bring to Scotland – estimated to be around £30 billion worth of investment and up to 20,000 Scottish jobs, while cutting emissions and delivering energy security. He adds that the Hywind II floating offshore wind farm project could push the boundaries of deepwater offshore wind beyond the 100 m mark. First Minister Salmond met Statoil during a visit to Norway to foster economic ties and cooperation between the two countries. Renewable Energy Focus notes, however that there is no mention of cost for the project, nor of the challenges of linking a potential floating offshore wind farm to the grid if placed far offshore. International consultancy Halcrow Group Ltd has identified 10 areas with potential for offshore wind development in the short term, and 25 with potential in the long term, in its examination of potential for offshore wind energy development in Scottish Territorial Waters. Materials testing company Element Materials Technology is to acquire Exova Group, a provider of testing and calibration services based in Scotland. Composites UK, the trade association for the UK composites industry, has launched the preliminary agendas for its autumn program of events. Scientists have discovered a unique copper-silver nanoparticle with a structure that resembles a traditional Japanese glass fishing float.